Nodes and relations can be styled using the My Styles UserStylesView that is accessible from the shortcut in the User panel. When the UserStylesView is opened, it automatically displays all styles that are used for the all nodes in the active NetworkView(s). Node and relation styles are applied in a cascading manner. 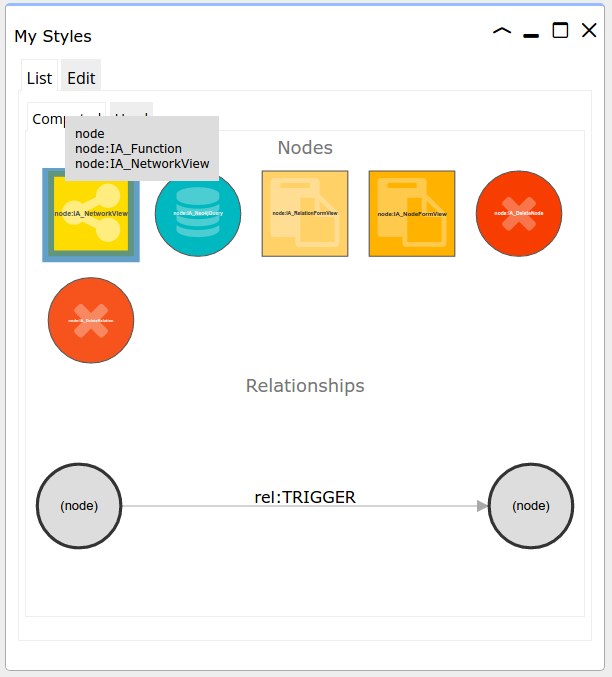 To view which styles are applied for a specific type of node or relation, switch to the "Computed" tab, and hover over a node. The computed styling of :IA_NetworkView node in the image is derived of three styles: node:, node:IA_Function and node:IA_NetworkView, because these three styles match have selectors that match with the :IA_NetworkView node. After all, it is a node, and it has, besides the IA_NetworkView label, also a IA_Function label. If you now click the node in the UserSylesView, the three relevant styles appear in a list. Each of them has a styling definition in JSON format. The styles are applied in the order that they appear in the list. 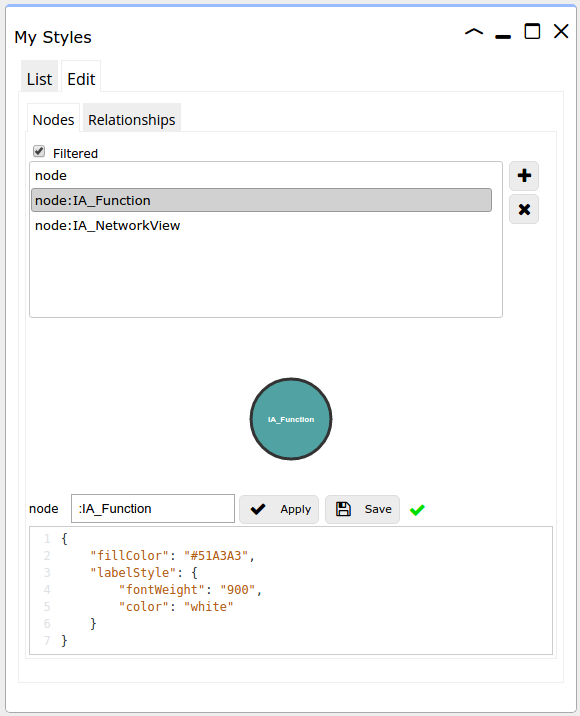 The full lists of styled selectors for nodes and relations are accessible via the Edit tab. node:MyLabel[myParam>5] applies to any node with a :MyLabel label and for which the .myParam property value is greater than 5. You can move the selectors up and down to influence the order in which the styles are applied. The words node and rel should be omitted in the edit box. To test the styles, click [Apply] and then, to save the styles, click [Save].